Last week, I sent my weekly newsletter to my email subscribers. In the email, I included a new photo of my recent success story. The response was phenomenal. I got multiple emails and texts asking who that person was. They were so impressed by her transformation that they had to know more. This is my wonderful client, Valerie! I personally have been training Valerie for over a year now. As you can see from the photo, she has undergone an amazing transformation! Valerie was actually referred to me by my clients Sheryl and Diane. Valerie is the perfect example of the client that seeks me out. Valerie had gained 80 pounds over the years. Her diet was horrible, and the weight gain prevented her from doing a lot of the things that she used to love. She would go climbing and hiking quite a bit with her husband, but because of the weight gain, she couldn’t physically do it anymore. After I got Valerie signed up and ready to go, she went for it. Valerie knew she had to change her outlook. 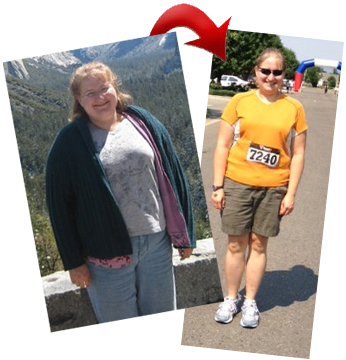 She had to prove to herself that she could make a complete lifestyle change. She had to convince herself that enough was enough and that only she could make the change to improve her life. Valerie meets with me 2x/week for only 30 minutes each time in her home. She also meets with Esther Hansen, the registered dietitian that I have partnered with (www.ftcollinsweightloss.com). Valerie completely changed her mindset when it came to her food choices. She used to be an emotional eater. However, after meeting with Esther, she now has her nutrition in check. In fact, just recently Esther told Valerie that she doesn’t need to see her anymore. She told Valerie that she, “gets it.” However, Valerie decided to just check-in with Esther every other month instead of every month. Valerie’s biggest win, however, is that she has made the conscious choice that she will NEVER go back to that before picture. I have always said that the hardest part of being healthy is making the choice to be healthy AND taking massive ACTION! It’s always one thing to have a goal; it is another thing to take action to accomplish that goal! Valerie is now able to do the things that she used to do with her husband. She goes to the climbing gym regularly. She and her husband just climbed Horsetooth Rock a couple of weeks ago. AND she rides her bike all around town now! But don’t take my word for it. You can see her wonderful personal training testimonial here. I am extremely proud of what Valerie has accomplished. We are more than half way to her long term goal. Valerie now lives a healthy lifestyle. That before picture is never going to happen again. Valerie is driven, dedicated and proud of what she has done for herself. Valerie reminds me time and time again why I became a personal trainer. I am happy that I can change my clients’ lives with health and fitness, and I am truly blessed to have the opportunity to do so.